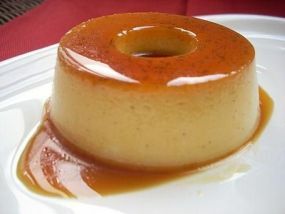 Dulce de Leche is a Brazilian Food Recipe for sweet milk pudding. With a hand mixer or in a blender, beat eggs. Add condensed and whole milk and blend well. Set custard mixture aside. Heat sugar over medium-high heat in a small saucepan, stirring constantly, until the sugar caramelizes (turns brown and syrupy). This may take 20 minutes. Quickly pour sugar mixture into bottom of ovenproof 2-quart mold or bowl, coating the bottom and sides of container. Pour custard mixture into the mold. Bake at 350°F for 45 minutes, or until a toothpick inserted in the center comes out clean. Chill until ready to serve. Turn onto platter. The pudding will be covered with a caramel sauce. At what point are the eggs used? Sorry. Just re-read it and see my error!